Please paste the above link into your browser to watch the lecture. out if animals (other than humans) can do it. He even discusses a bird that moves to music (from the film "The Wild Parrots of Telegraph Hill"). Of course, this was all pre-Snowball! 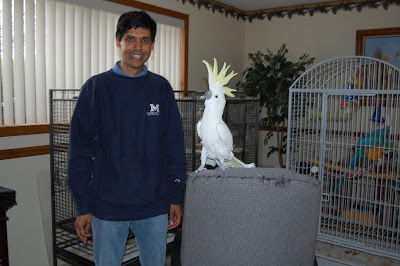 Irena and Charles of Bird Lovers Only Rescue Service, Inc. would like to thank Dr. Aniruddh Patel for his visit on April 3rd, 2008 and for our continued collaboration on this very exciting and interesting project! A very special thank you to Dane, for none of this would have been possible without you! Pictured above is Aniruddh Patel, President of the Society for Music Perception and Cognition, with Snowball. Thank you for visiting our blog site. We hope you find it enjoyable and educational. We will be featuring stories on some of the birds at our rescue/sanctuary, favorite recipes (Treat Street) from friends and recipe books , and some helpful advice from vets and other sources. Bird Lovers Only Rescue Service, Inc. is looking for volunteer help. We need people who are quite knowledgeable on bird needs and care. Must be dependable and have reliable transportation. Please email us at birdloversonly@sbcglobal.net or call 219-322-0037. THANK YOU! "Advanced Bach Flower Therapy" by Gotz Blome, M.D. "Music, Language, and the Brain"
Our goal is to build an addition/habitat for the birds to make their stay more enjoyable while we find suitable permanent homes for them. This can only be accomplished through donations.